Do you enjoy working in a clean, climate controlled environment? The Advance Group has partnered with a manufacturing company in Belleville, MI that specializes in the production of business and custom envelopes. We have an immediate opening for a full-time Machine Operator. This is a temp to hire opportunity working Monday-Friday training on 1st shift from 7am-3pm for a few weeks before moving to 2nd shift from 3pm-11pm. Starting pay is $12 per hour. Candidates must be able to pass a pre-employment drug screen. With joining the Advance team in 2016, Stephanie has found that her greatest accomplishment is matching employees with companies that are mutually beneficial. Helping employees find their perfect position is a challenge that she takes pride in doing. 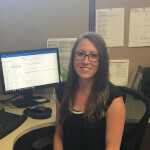 With Stephanie’s Customer Service background, she thrives in helping others in any way she can to ensure that every interaction with The Advance Group is a positive one!